Jo, who blogs at myBearpaw, is a long time hand quilter who does the most beautiful work. Today she is here to tell us how. 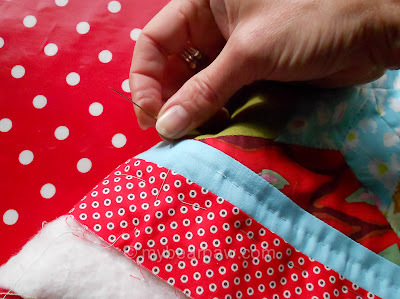 I know you will love this tutorial, I sure do, and I plan to give hand quilting another try using all these tips - read on. 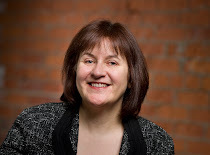 Hello, my name is Jo Avery and you will usually find me over at myBearpaw blog. But today I am going to share my 20 odd years worth of hand quilting experience with all you FALers. 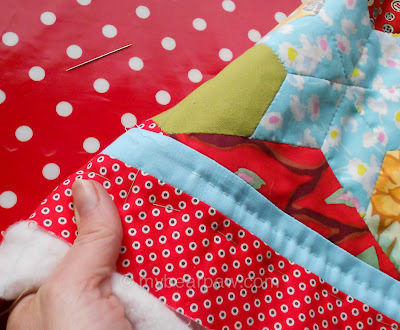 Now don't worry, that doesn't mean I am some sort of ninja quilter with all sorts of moves that you can't possibly emulate - hand quilting is one of the easiest things in the world, after all it's just a running stitch! But I have learnt quite a few shortcuts and tricks over the years and have also learnt from my mistakes, so I hope you will find something useful in this tutorial. For most of my hand quilting 'career' I used a traditional cotton quilting thread, preferably Gutermann's in an off-white shade like the reel above. 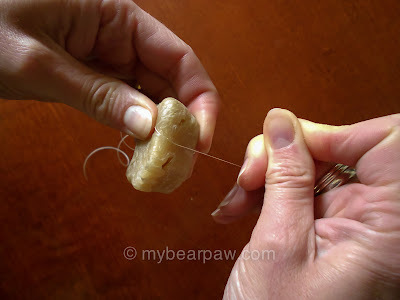 I was taught to run my thread through beeswax before I started sewing to give the thread extra strength, stop it from twisting and enable it to lay flat on the quilt. 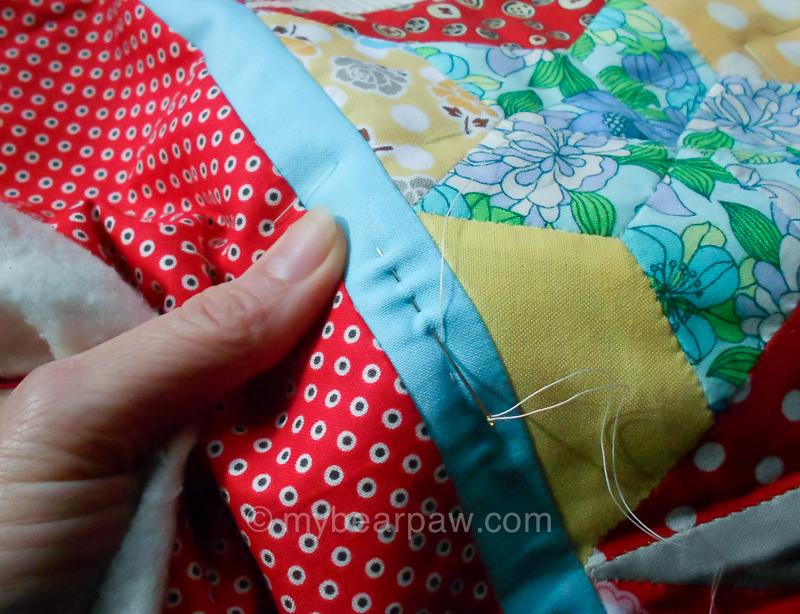 I still am not totally sure how much difference it makes, but it is a part of the ritual of hand quilting for me, so if I use a cotton quilting thread then I always do it. However a few years back I started quilting using perle cotton number 8. 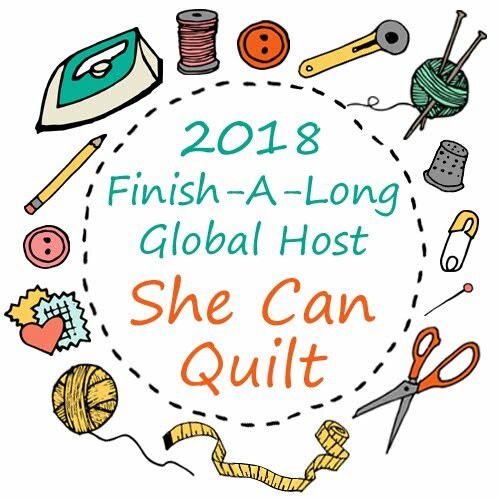 I instantly felt I had found the quilting thread I had been looking for all my life! It adds an extra texture to your patchwork with it's beautiful sheen and colours, and more importantly it is thick enough for you to actual notice it! 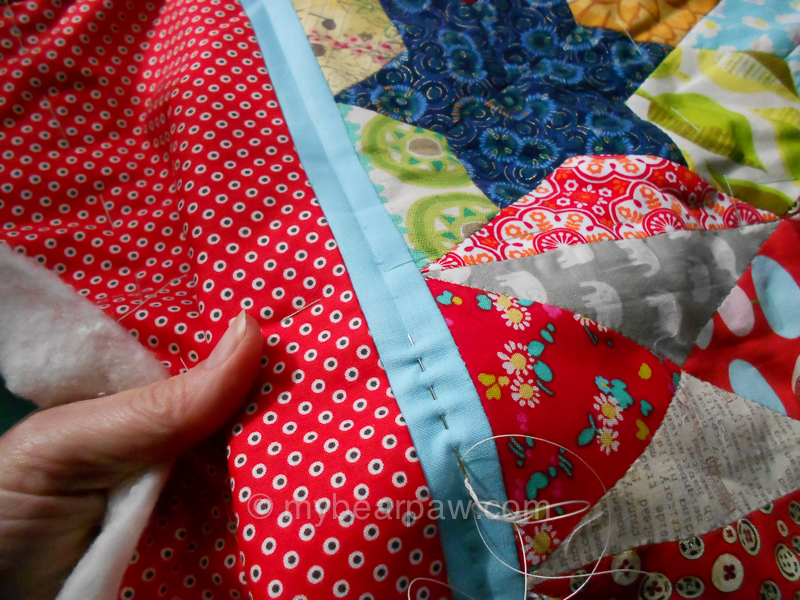 Why put hours into hand quilting just to see a slight indentation? That's a bit harsh but hopefully you know what I mean. So now I use perle cotton all the time, and usually I include as many colours as I can in each project. 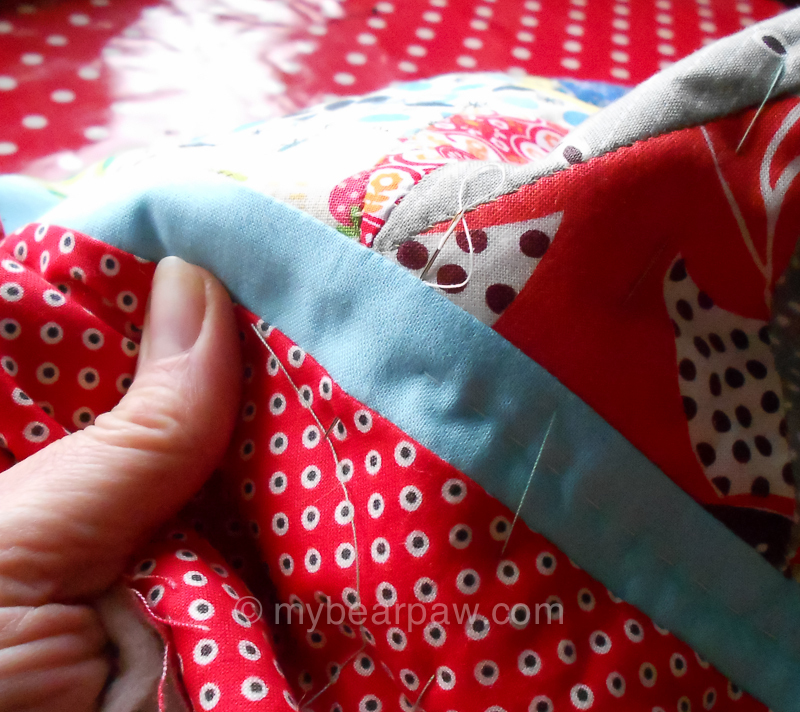 But before we move on to perle cotton I want to show you how I would tackle using regular quilting cotton. I am about to quilt this small EPP lap quilt which is one of the things I had hoped to finish as part of this quarter's FAL (and as I type this I still have a week to go!). There are 2 things I would like you to notice about the photo above. One is the tacking stitches and the other is the thimble. 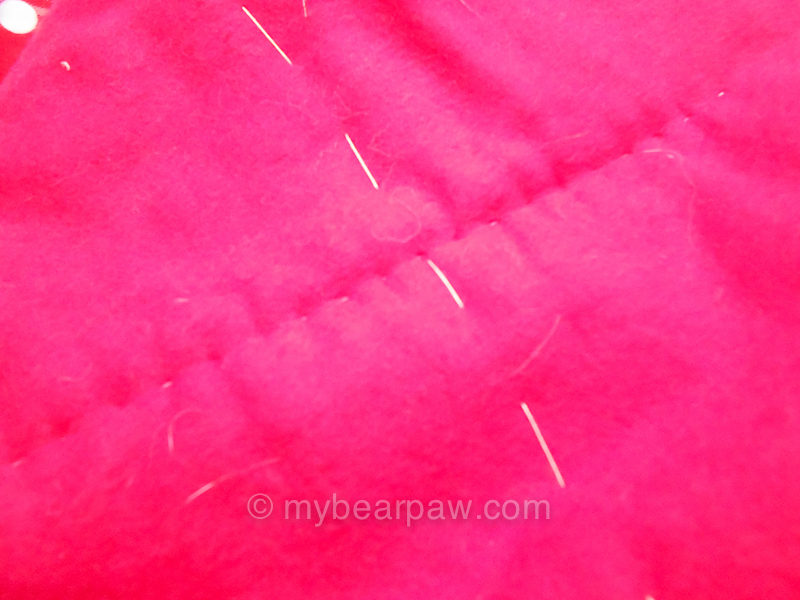 When I hand quilt I always baste my quilt with tacking stitches rather than safety pins. 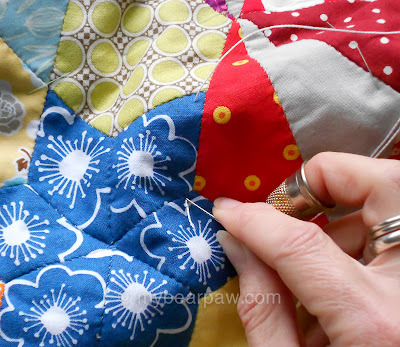 This is very much a personal preference, but I am probably going to be spending weeks or months working on a hand quilted quilt and I feel that tacking gives more stability to the quilt and is also easier to work with by hand than pins. I like to tack my quilts on my big dining room table on top of an oilcloth tablecloth. 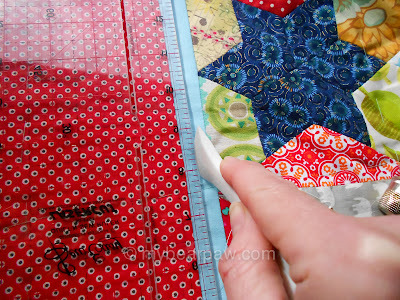 You do not need to tape the back of a tacked quilt to a surface. I haven't worked out exactly why, but trust me, I am as sure that you really don't as I am sure that you really do need to if you are safety pinning. The other important thing in this photo is the thimble. You really need to wear a thimble on your middle right finger (presuming you are right handed). If you don't you will get a hole in the side of that finger and it will be very sore and you will have to stop sewing. 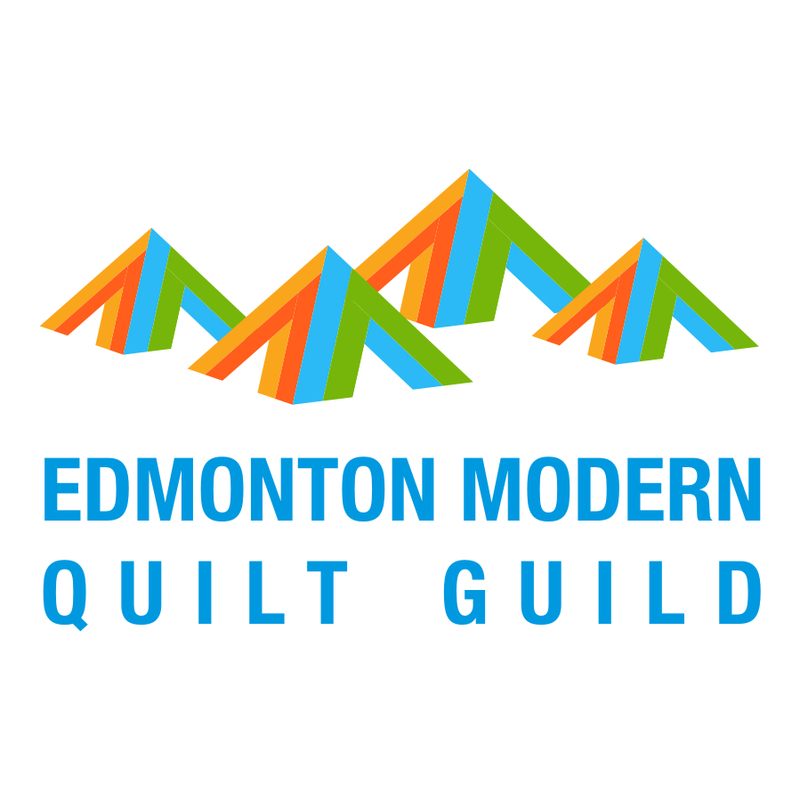 When I teach my students to hand quilt they find the thimble very uncomfortable at first. I tell them to persevere, but if they or you are really struggling then I would suggest buying a more fitted textile thimble with metal mesh in the relevant place, like this one by Clover. 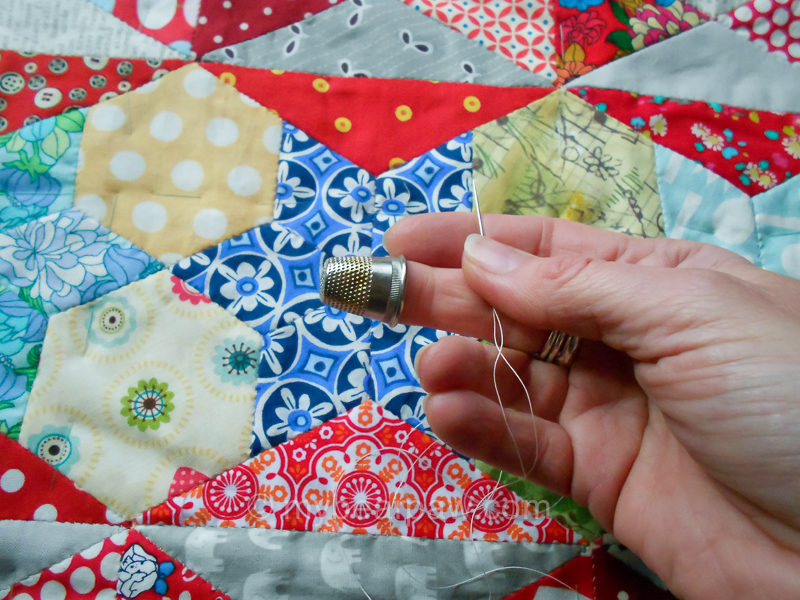 Some quilter's also like to wear a thimble on the middle or forefinger of their left hand. Over the years I have tried this, and I have tried leather thimbles and little metal disks that you stick to your finger tip, but have now given up as I feel those fingers need to be free to 'feel'. So nowadays I just accept that those 2 fingers are going to get pricked. Try and keep them out of the way of the needle as much as possible, and alternate between the one 'taking charge' of the needle as it appears through the back of your quilt. So let's get on with some quilting! The important thing about quilting as opposed to other hand sewing is that we do not want to see any knots on the back. So we need to learn how to 'bury' our starting and finishing knots in the layers of our quilt sandwich. First of all cut yourself a length of thread ( I use a length of no more than 30"). Run it through your beeswax a couple of times, if you are using it. Knot one end and then insert your needle about an inch and a half from where you would like to start stitching (through the centre of your layers, you mustn't be able to see the thread from the back). You can just about see the tiny knot sitting on top of the quilt in the photo above. Now grasping the thread close to the quilt give it a firm tug and the knot should disappear into the quilt (making a satisfying popping sound). 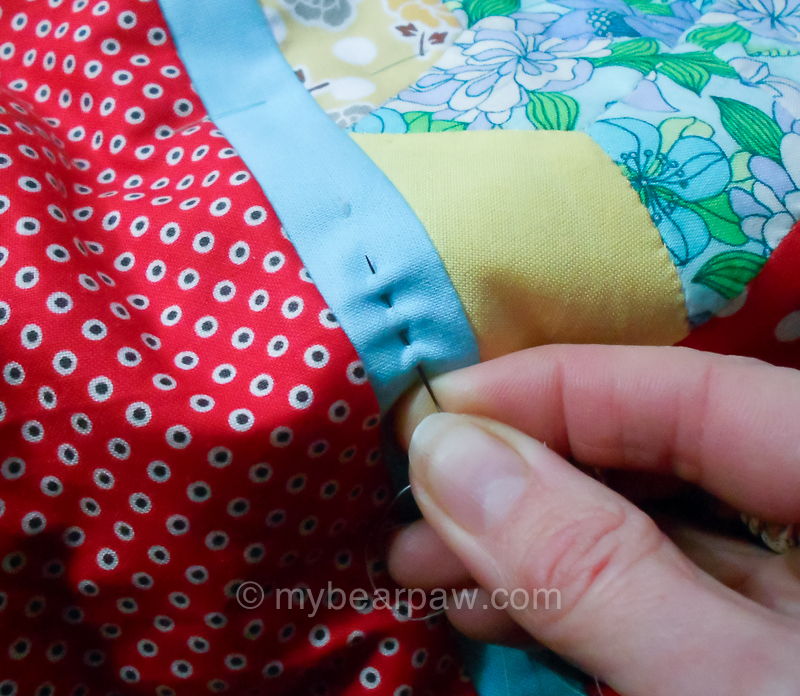 Don't pull it any more, you want it to sit just below the surface so that you can sew over it and secure it. Start quilting towards the knot. I like to leave the tail sitting on top so I know it hasn't disappeared completely and then a tuck it in by placing my needle just under the top layer and catching it. 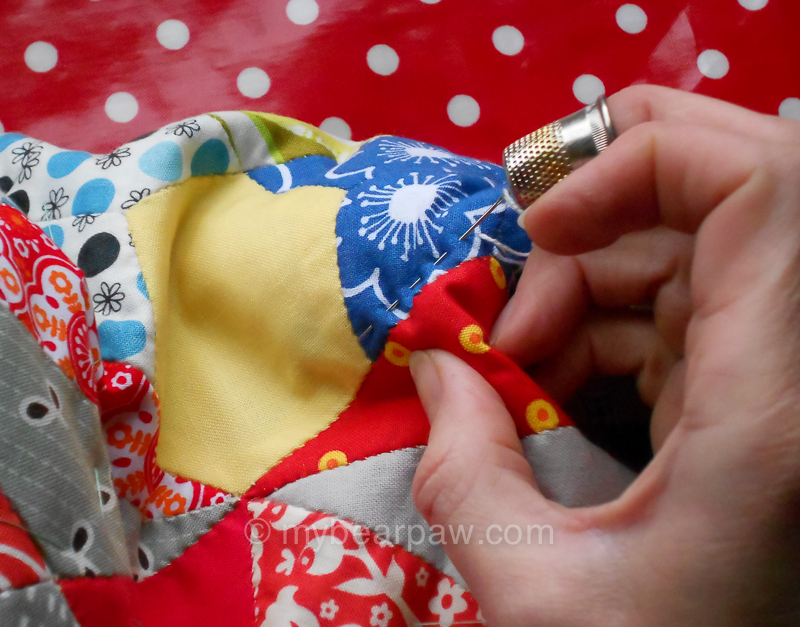 I should also add that these photos don't show me quilting very naturally as nobody was in the house to help me take the photos when I did this tutorial so they all show me one handed (apart from the beeswax one which I did on the following day). Now we are off and quilting. 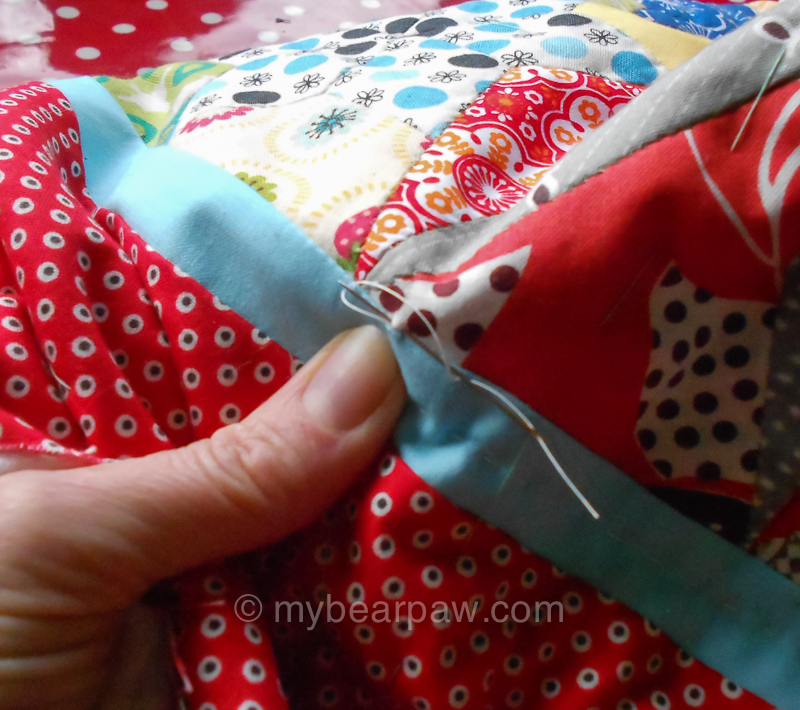 It is important to build up a nice 'rocking' rhythm as you sew. This is hard to show in static photos but you want to be going in and out, up and down, gathering 4 or 5 stitches on the needle before you pull it through. If you are right handed you always sew from right to left, the opposite of hand writing. When using quilter's cotton move the position of your needle along the cotton occasionally as you work to stop the cotton wearing away at one point. 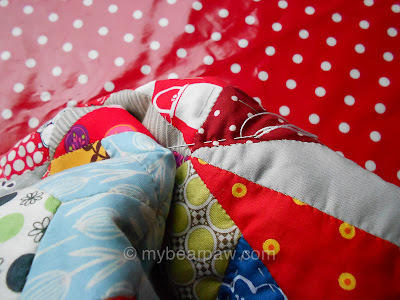 A few other points, always start quilting from the centre of your quilt out. I have not done this above, because I want to use perles for most of the quilt and just wanted to do a tiny bit using cottons to show you. This border bit was the only place I thought it would work design wise so I started there. This is very naughty of me (please don't tell the Quilt Police! 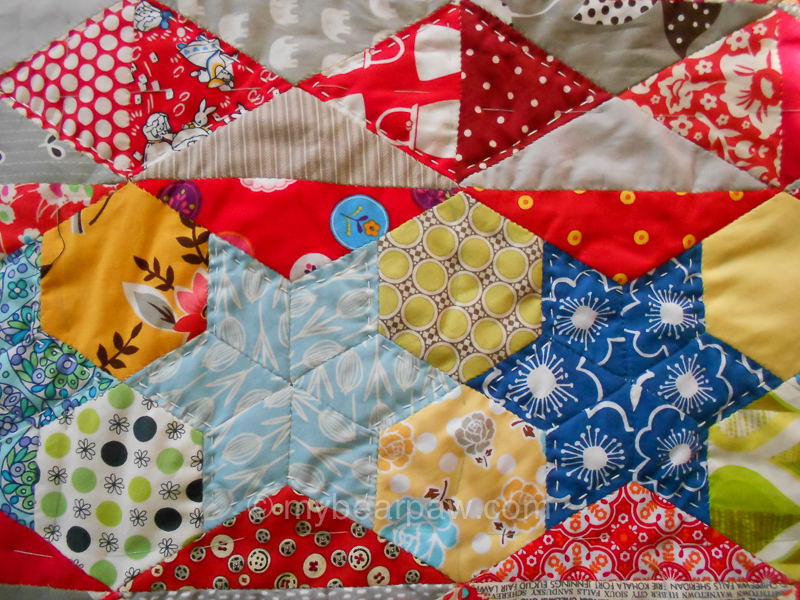 ), but as this is such a small quilt I think I will get away with it. The other thing is that I do not use a hoop. I know that this is usually advised but I don't like it (I find it too constricting and get annoyed by having to keep moving it around the quilt just as I get going) and haven't felt that my quilting has suffered without it. I would suggest trying it for your self if you fancy it as I know a lot of quilters swear by it. Let's have a look at the back. Apologies for the very bright scarlet apparition above! I am using a red flannel and it has really caught the light. You can just see the indentation of the stitches. I was taught that you should aim for the stitches on the back of your quilt to look the same as the stitches on the front. This is very hard to do. I wouldn't worry too much about that. It will look lovely either way. 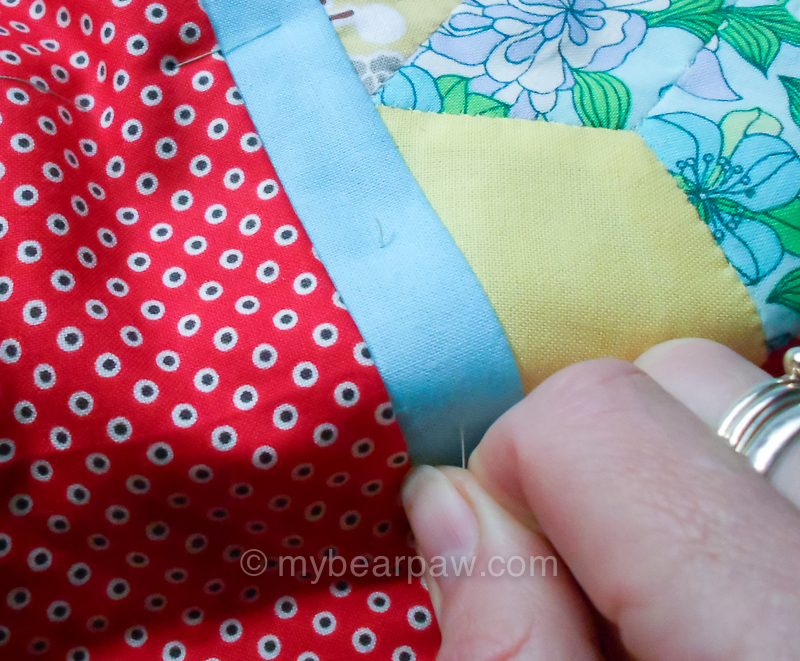 I am happy sewing a straight line by eye as long as I have a parellel line as a guide, but for those of you who would find this a struggle then you can mark lines on your quilt top. Above I am using a Hera marker by Clover. This basically just gives you a crease that you can follow (see below) without worrying about getting rid of the line later. You can also use masking tape to mark straight lines. I have always been very suspicious of quilt makers as they don't always come out as easily as promised on the pack. However Katy from The Littlest Thistle blog recently put me on to this amazing pen. It is a Frixion pen by Pilot. It works just like a fine liner but once you have finished with the line you simply iron it and it completely disappears! Like magic! It is my new best friend which I use for embroidery, applique and quilting. You can get them from any good stationers or supermarkets. We are now coming to the end of our thread and we need to learn the finishing knot. Stop when you have a couple of inches of thread left and make a 'big gap' stitch, the size of a stitch and it's space between. Try to bring your needle up at an angle from the back so that you don't end up with a long, unsightly stitch on the back. Now tie a knot to sit approximately a stitch length from the end of thread that's coming out of the quilt. This is a bit fiddly at first but gets much easier with practice. 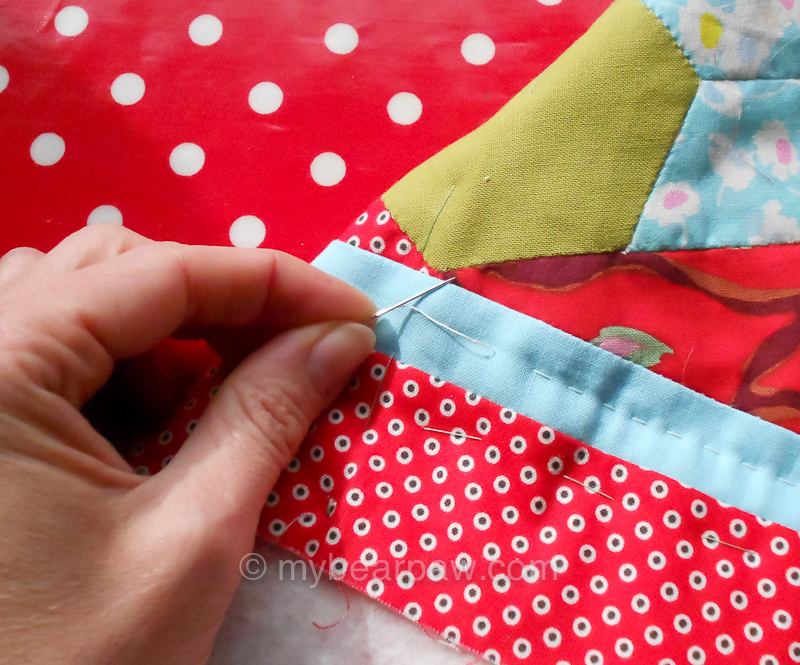 Now place your needle into the middle of your 'big gap' stitch and bring it out a good distance away in the direction that you will continue stitching (with a new thread). As with our starting knot we now need to give a little tug on the thread to pull it in to the quilt layers (listen out for that little pop). The idea is that your next thread will now stitch over the tail of thread inside the layers securing it there and stopping the knot popping back up. But in reality that doesn't always happen and often this is the bit of thread that will start to unravel with use. So there are a few things you can do. You can tie a double knot (one on top of the other) this is fiddly but possible. Or you can use my cheat method below. 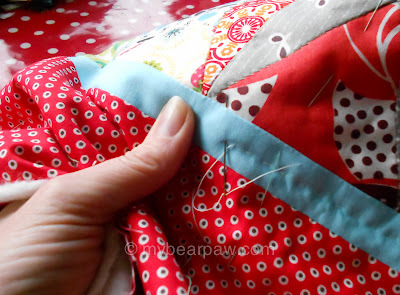 This is very much an 'illegal' quilt method (again don't tell the Quilt Police) but it does achieve the 2 important points of securing the thread and not showing a knot. You will need to find the right place on your quilt to do this though. You are looking to stop near a seam with light coloured fabric (assuming you are using light coloured thread). Take you needle through the layers so that it comes out in a seam as above. Make a tiny stitch either side of your thread and loop your thread around your needle as if making a French knot. Pull thread through and then place your needle at the base of this knot and send it through the layers to a distant point as below. Pull hard, cut thread, and hopefully you won't be able to see a thing as the tiny knot is buried in the seam, as below. Right, now we are going to play with some perle cotton 8's. As I said, normally I would use every colour I could get my hands on (I am very much a 'more is more' sort of person! ), but as this is such a dark, primary coloured top I am going to use just white. 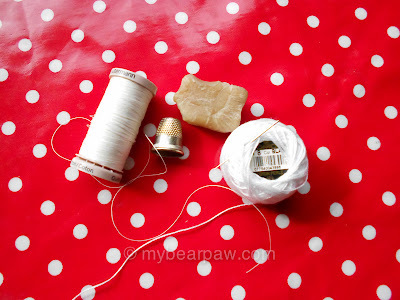 Cut the same length of thread but DON'T use beeswax! You can use exactly the same starting knot as before but you will find it harder to get the knot down into your quilt layers. 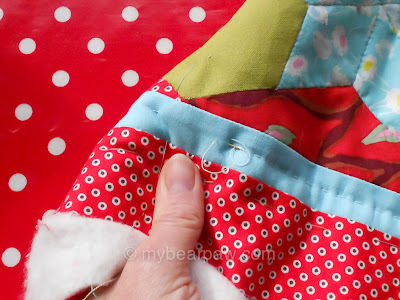 If you are really struggling then work your needle into the hole (in the fabric where your knot wants to go) and make the hole a bit bigger, then just give it a very firm tug. The advantage is that the perle knot will really stay put, being bigger and less slippery. This means that your finishing knot should be more than secure enough and you won't have to resort to cheating or fiddly double knots. The perle doesn't slip through the fabric quite as nicely as the cotton. Above I have tried to show how you should use you thimble to give it a good push. I like to make my quilting stitches larger when I am using perles but keep the gaps between them small, in the way that Sashiko is worked. This is so I can see as much as possible of the lovely perle cotton. My students always ask how to work from the middle of a large quilt where you can't get hold of an edge. Above I have tried to show you how I am grasping the quilt from underneath and making a sort of 'oven glove' from it. 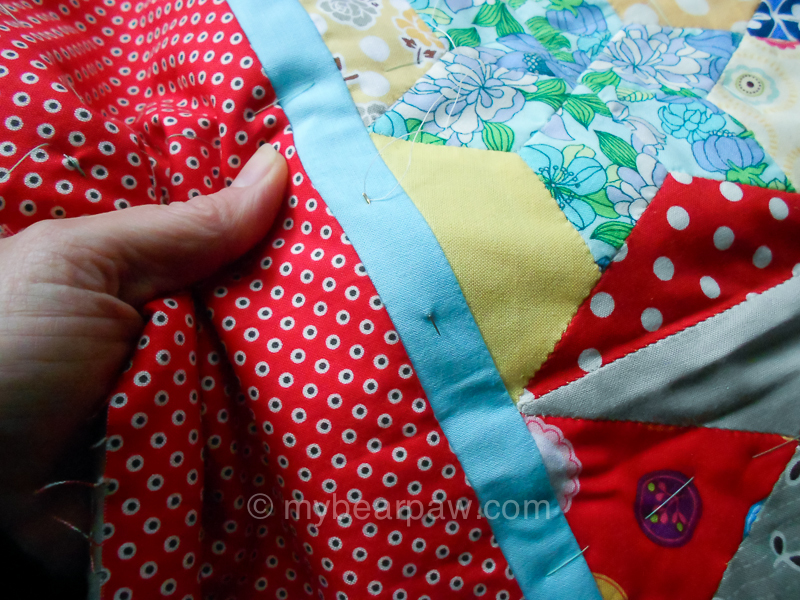 If you have tacked your quilt securely to begin with then don't be afraid to writhe it around to get a good grip on it. I like to use the pattern of the quilt top to inspire the design of the quilting as much as possible. Though sometimes it can work well to mark out a very different design on top of your patchwork. Here I am stitching round the stars. When you finish quilting round a motif but still have thread to use you can 'send' your thread through the layers of the quilt and start sewing again at a new spot (to avoid too many fiddly knots). Above I am sending the needle through to the diamond I am going to outline next. Just a few words on needles. Quilting needles are traditionally short and quite stubby. This is because with heavy use an ordinary Sharps or Betweens needle will bend like a banana. However I find a longer, finer needle easier to quilt with so I just replace my Sharps when it bends (after all they only cost pennies). I would use a 7 or 8 sized eye for quilting cotton and a 4 for perle cotton. The perle thread is rounded and full and doesn't like being squashed into an embroidery shaped eye, so I use a Sharps number 4 and my favourite brand is Millward who do a nice thin needle (some of the other brands like Pony produce a really thick heavy needle to go with the bigger eye which isn't very good for quilting). Well who would have thought I had that much to say about a few running stitches! Congratulations to any of you who read all of this and I hope you found it helpful. Please fell free to ask me any questions in the comments, as, despite the length of this post, I'm sure I've missed something out! Great tutorial and very useful advice! 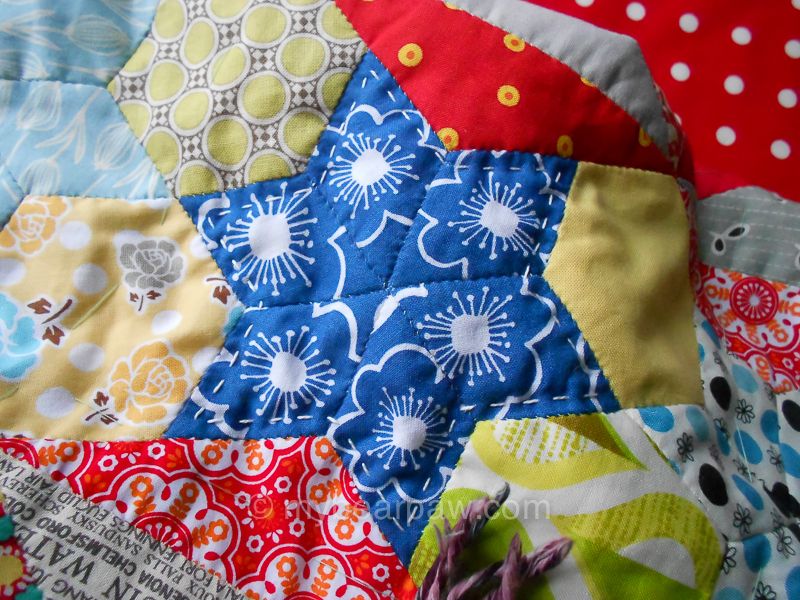 I was lucky enough to be taught to hand quilt by Jo a few years ago and her tips, tricks and cheats were invaluable! 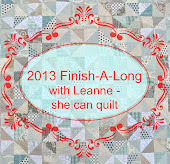 She is a beautiful quilter and you gotta love her renegade "just go for it" attitude. Nice tute, Jo! Super useful. Greta pictures to go with your steps. Tahnsk so much for the detialed advice. Thanks for a great tutorial. I m sure I will refer back to it time and time again. I am a total numpty when it comes to needles! What a fabulous tutorial - thank you! This is a great tutorial, I really appreciate all the helpful things I learned already! 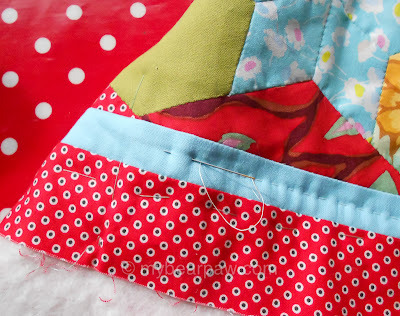 What a great tute - I love hand quilting and should do more...I use a hera marker but I'm going to ask my mum to look out for one of those Pilot pens! Hand quilting gives unbeatable texture! Great tutorial and what a beautiful quilt! I'm currently using Pearle 8 on a baby quilt for the first time. I think I'll try your favorite needle...may go better! Brilliant tutorial! Thank you, Jo and Leanne. I'm definitely going to give it a go. I just need to get some Perle 8 and needles. Thank you for the tutorial. I have never quilted anything, but am trying to learn as much as possible. It took me a while to figure out what you were doing, but I've got it now. Looks like an amazing amount of work. But what a lovely outcome. Oh I do so love the look of hand quilting, I just need to find the patience! Thankyou so much, that was very much appreciated. Michelle. What a great tutorial, thank you! 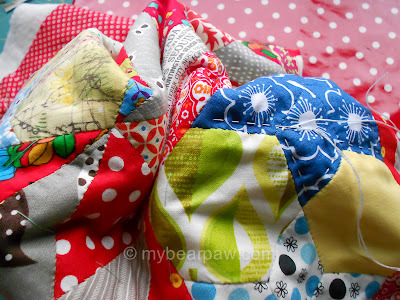 I haven't tried hand quilting, although I love the look of it. I find my left thumb joint aches when it grips fabric, eg in embroidery, so I use a hoop. Maybe I would have to try a hoop for quilting? This is delightful - thank you for sharing all the pics and great info! Thank you this was very interesting. I use a leather thimble on my right hand and sometimes on my underneath hand I will use a plastic band-aid-it still lets me feel the needle but protects a bit. 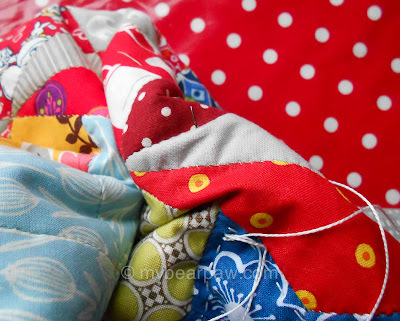 I love reading tutorials, never sure that I will find time to make a full size quilt but I am definately going to try hand quilting on my next cushion or lap quilt. What a brilliant tutorial! I have a double quilt just waiting for me to pluck up the courage to hand quilt!! But I was bamboozled by which needle and how best to tackle it. So thank you for giving me a good shove!! This was a really instructive post - thank you so much for taking the time to share! Do you still wax your thread when you use the perle cotton 8? Thanks for sharing. I have been hand quilting without a hoop and its been fun. Looking forward to doing more. As you can see, I found this tutorial a few years later. 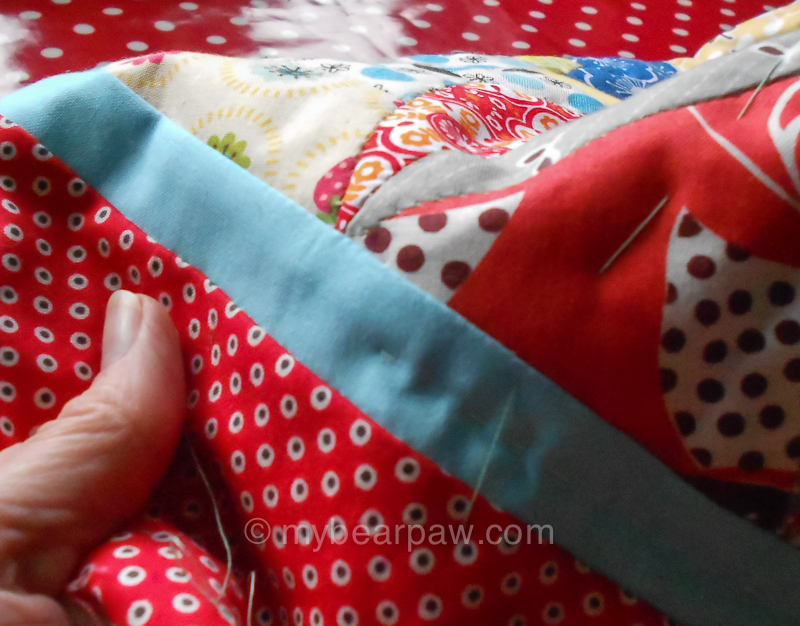 This was an excellent tutorial on hand quilting, giving me the desire to try hand quilting once again. Thanks for sharing and have a great day! I love Frixion pens! Do test them on a piece of scrap fabric first, though, as sometimes they leave a bit of a white line behind. This should wash out, but still best to just test it first. Very new to hand quilting. Your tutorial is very benificial and full of great tips. Thank you for the post; it's wonderful for new folks like myself. 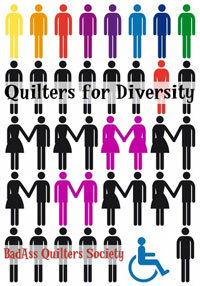 I'm piecing a quilt for my son and daughter-in-law-to-be this summer. My mother gave me a quilting stand years ago, so I love the idea of basting my layers before quilting. That way I can leave the work in progress on the stand until I'm done (a year from now?). Nice tutorial. BTW - beeswax is great for reducing knotting! WOW. THANK YOU. NOW I CAN FINISH MY HEAVY QUILT.